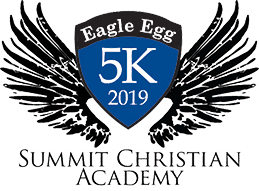 Click here for results from the Eagle Egg 5K 2019! In the event of dangerous weather, the race director may cancel or amend the race for everyone’s safety. No refunds will be given. If weather conditions are unstable on race day, please check this website’s Home Page for last minute updates. Where can I park for the Eagle Egg 5K? You are welcome to park in the SCA or Lee's Summit Community Church parking lot. There will be volunteers who will show you were to park. Race Number: Pin it on the front of your shirts ~ we will provide pins with the race bib. Chip: You will be timed electronically by computer timing chip. Your chip will need to be attached to your race bib; You must cross both the start and finish lines to receive your official time in Race Results. Water will be available at the start/finish area. No Clothing Check so please leave all valuables at home or locked in the trunk or back of your vehicle. Course Safety is important. Although the course is monitored by the Lee’s Summit Police and our volunteers, please be careful, follow instructions and watch out for others. NO HEADSETS or similar devices, skates, bicycles, wagons or dogs. Strollers and baby joggers must start at the back of the RUNNERS START or the back of the WALKERS START. Must be present to win prizes and awards.